So order yours today and send us an Email of your order! Help Promote The Apocrypha & Other Lost Books..!! FREE BUMPER STICKER..!! below... 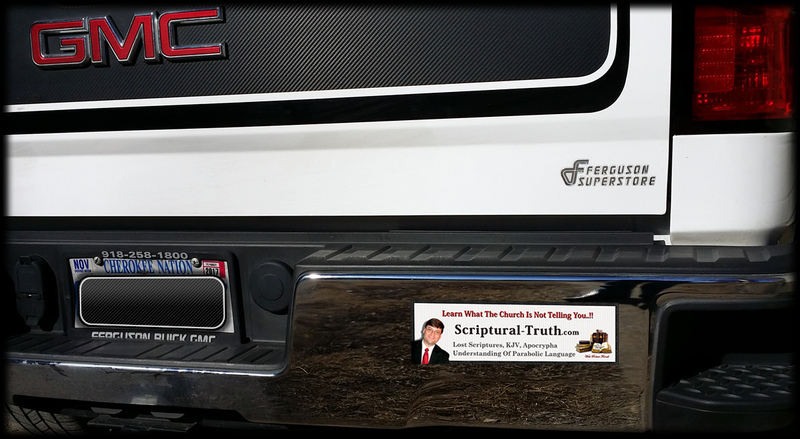 These Bumper stickers turned out nice... We have FREE Bumper Stickers with FREE shipping, Due to cost we have limited it to 3 Bumper Stickers for as long as they last. No limit on how many times you order. Just send us an E-mail and request on how many Bumper stickers along with a complete shipping address. Please use the word Bumper Sticker in the Subject line of your email... No donation required. Click here to E-mail... or copy & paste; ricksimpson@cox.net Note... We Do Not share your information with anybody. FREE BUMPER STICKER..!! Absolutely FREE..!! They are not to be sold for profit. Thank You..!! Thank You..!! for all of your blessings and encouragements. From Robert Ferrell and Rick Simpson.